These crimes include offences carried out by Islamic State extremists. GERMANY RECORDED A sharp rise in politically-motivated crimes by foreigners includingjihadists and Kurdish militants last year, a trend branded “unacceptable” by Interior Minister Thomas de Maiziere this week. Some 3,372 such cases were recorded last year, up 66.5% from 2015, according to the latest crime statistics unveiled by deMaiziere. They include “criminal offences carried out in the name of foreign extremists of the so-called IS, or the (outlawed Kurdish militants) PKK”, said the interior minister. 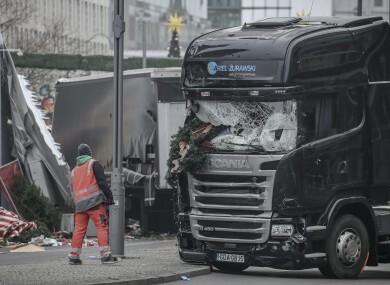 Germany was hit by a string of jihadist attacks last year, with the deadliest being last December’s assault on a Christmas market in Berlin. A Tunisian suspect had rammed a truck into the crowded market in the attack claimed by the Islamic State organisation that killed 12. But beyond jihadist attacks, Germany has also seen a rise in violence pitting its sizeable minority communities of Turks and Kurds, as Turkey was increasingly split over President Recep Tayyip Erdogan’s rule. Email “Germany sees massive rise in politically-motivated crimes by foreigners ”. Feedback on “Germany sees massive rise in politically-motivated crimes by foreigners ”.